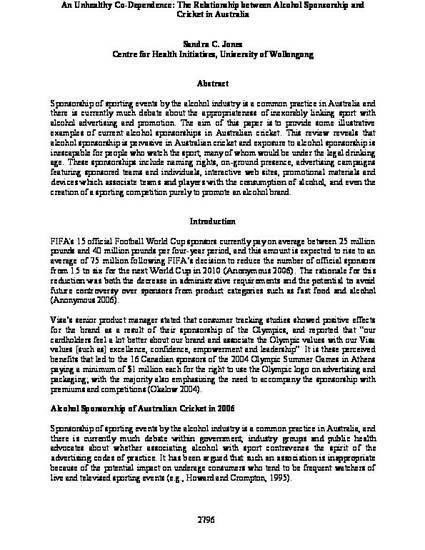 This conference paper was originally published as Jones, SC, An Unhealthy Co-Dependence: The Relationship between Alcohol Sponsorship and Cricket in Australia, Proceedings of the Australian and New Zealand Marketing Academy (ANZMAC) Conference, 2007, 2796-2802. Sponsorship of sporting events by the alcohol industry is a common practice in Australia and there is currently much debate about the appropriateness of inexorably linking sport with alcohol advertising and promotion. The aim of this paper is to provide some illustrative examples of current alcohol sponsorships in Australian cricket. This review reveals that alcohol sponsorship is pervasive in Australian cricket and exposure to alcohol sponsorship is inescapable for people who watch the sport, many of whom would be under the legal drinking age. These sponsorships include naming rights, on-ground presence, advertising campaigns featuring sponsored teams and individuals, interactive web sites, promotional materials and devices which associate teams and players with the consumption of alcohol, and even the creation of a sporting competition purely to promote an alcohol brand.